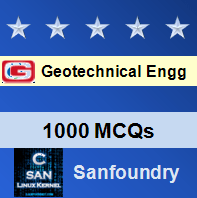 This set of Geotechnical Engineering Multiple Choice Questions & Answers (MCQs) focuses on “Types of foundation”. Explanation: Foundations may be broadly classified under two heads: shallow foundations and deep foundations. 2. A foundation is said to be shallow if its depth is ________ than its width. Explanation: According to Terzaghi, a foundation is shallow if its depth is equal to or less than its width. In the case of deep foundations, the depth is equal to or greater than the width. 3. which of the following, is a type of shallow footing? Explanation: The shallow foundations are of the following types: spread footing (or simple footing), strap footing, combined footing, and mat footing or raft footing. 4. Which of the below is the most commonly used shallow foundation? Explanation: In spread footing, load is transmitted through an isolated column or wall to the subsoil; hence this is most common type of foundation. Explanation: Both from observations as well as the analytical studies from elasticity, it is known that the pressure distribution beneath footing is not uniform and it depends on the rigidity of footing, the soil type, and the condition of the soil. 6. Once the pressure distribution is known ___________ in the reinforced concrete footing can be calculated. Explanation: Knowing the pressure distribution is known, the bending moment and shear force can be calculated, and the thickness of the structural member of the member can be calculated using properties of reinforced concrete. 7. In conventional design, allowable bearing capacity should be taken smaller than which of the following value? Explanation: In conventional design, the allowable bearing capacity should be taken as the smaller of the following two values: i) the safe bearing capacity based on ultimate capacity, and ii) the allowable bearing pressure on tolerable settlement. Explanation: When a footing rests on cohesive soil, the edge stresses may be very large, but the pressure distribution may be considered to be linear. 9. When do strap footings are used in foundation? Explanation: A strap footing may be used where the distance between the columns is so great that the combined trapezoidal footing becomes quite narrow, with a high bending moment. 10. When two column loads are unequal, which of the possible footing can be provided? Explanation: When the two columns load are unequal, with the outer column carrying a heavier load, and when there is space limitation beyond the outer column, a trapezoidal footing is provided.